Seasoned pro Traktor users will love it just as much as dabbling hobbyists. Built for the iPad, not a port. Great feature set. Transferable cue points. Scratching facilities not perfect on iPad. It is a statement on our culture that where we used to venerate new and useful tools, now we openly demand, "What took them so long?" 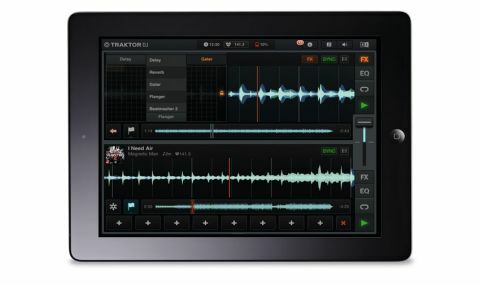 Still, having got our instinctive grump out of the way, we were excited to get our hands on an iPad version of Native Instruments' flagship DJ product, Traktor. "The app is tailored from the ground up for use on an iPad and can also be used with a full Traktor setup"
And it turns out it was worth the wait. Rather than creating a stripped down visual-port of Traktor, NI has created a DJing app tailored from the ground up for use on an iPad that can also be used in conjunction with a full Traktor setup. The main mixing interface is very well designed, utilising well-established gestures to make the most of your iPad's touchscreen. There are also some very sensitive scratching facilities, but touchscreen scratching is always at the mercy of humidity and the oiliness of your fingers on the day, so turntablists should not throw away their SL1200s just yet. All the obvious features are included, like BPM detection, auto-BPM matching, DJ-effects (reverb, delay, a pretty great glitch, etc), mix recording, iTunes sync and more. Another feature which will be really well received is the Mixed-In-Key-esque song-suggesting feature, which uses BPM and key analysis to make recommendations as to tracks to play next. Leaving aside the obvious question of whether your audience give tuppence ha'penny if the next song is in key when it makes them dance their rocks off, it is very well implemented. But perhaps the coolest thing for us is the ability to set up cue points, beatgrids and similar track-based settings on your iPad and then transfer them to the full Traktor. This last feature is squarely aimed at touring professional DJs, but can be useful for anybody.